People in England will get more online powers to rate GPs, police, childcare and councils, Gordon Brown has said. He said it was wrong that consumer websites such as Amazon and eBay had "higher standards of transparency" than those for public services. Officials liken the new approach to the Tripadvisor site, where travellers can share their thoughts on hotels. The PM promised an "information revolution", but the Tories said public services were still too bureaucratic. In a document called Working Together, Mr Brown acknowledges the government has been "much too slow to make use of the enormous democratising power of information". He says government must transfer more power to parents and patients. In a speech he said 2009 would be "our boldest ever year for public service delivery" and promised investment would not be cut over the coming year - despite the economic crisis. A site comparing council services is due to go live in May and the government is also bringing together a national crime map for England and Wales to be available online by the end of 2009. From this summer, patients will be able to comment on local services and provide feedback on GPs via the NHS Choices website. Childcare providers are to undergo similar scrutiny from parents via a site expected to be up and running early next year. Plans to rate policing apply to England and Wales, schools, councils and health services apply to England only while rating job centres and other welfare services will apply across the UK. Mr Brown said: "We are ushering in a new world of accountability in which parents, patients and local communities shape the services they receive, ensuring all our public services respond not simply to the hand of government, but to the voice of local people." He added: "People take it for granted that they will access other people's reviews and ratings before buying something on eBay or Amazon, and yet we do not yet have systematic access to other people's experiences when choosing a GP practice or nursery. "We have clearly got the balance wrong when online businesses have higher standards of transparency than the public services we pay for and support." But the British Medical Association, which represents doctors, said the "consumerist approach" was not suited to the NHS. Spokesman Dr Hamish Meldrum said: "Patients are not supermarket customers, and doctors are doing more than providing an easily rated commodity." 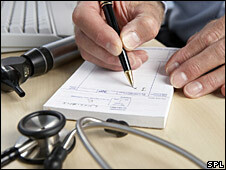 He added: "The suggestion that your treatment in the NHS can be as easily rated as a stay in a hotel is simplistic. There is a risk that this exercise could reduce NHS care to a meaningless popularity contest, encouraging perverse behaviours and an emphasis on the superficial." Meanwhile, a commission of experts has been set up to advise the government in England on the future role of nurses and midwives. It will consider how nurses could develop their skills as leaders and managers such as being given more freedom to commission and run their own services. However, plans to attract more outstanding people into teaching have been criticised by unions as "lacking detail" and "gimmicks". Other proposals in Working Together include identifying 200 teachers seen as future head teachers for promotion within four years and reducing the time it takes for people who are switching careers to qualify as a teacher from 12 to six months. Schools minister Jim Knight told BBC Radio 4's Today programme: "Some of our very brightest mathematicians have gone into banking and, if we've got an opportunity to get some of the best mathematicians and put them in classrooms properly trained and delivering for our children, then that has to be a good thing. Maths is one of our shortage subjects." But, for the Conservatives, shadow health secretary Andrew Lansley said: "This is a disappointing display of reheated announcements. "The Labour government have clearly run out of ideas." Liberal Democrat schools spokesman David Laws said: "This timid document ducks an opportunity to bring about much-needed reform of our education system. "Getting more talented people into the teaching profession and school leaderships roles is important. But ministers need to couple this with giving all schools extra freedoms and more money so that they can focus on raising standards." Is Brown a really bold reformer?